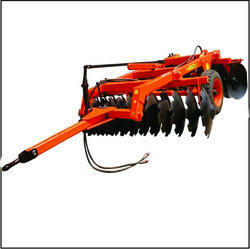 Type of Disc Harrow: Trailed Disc Harrow. We are the leading organization in the industry to provide our clients the best quality array of Offset Disc Harrow. Mounted Medium Duty Tandem Disc Harrow is designed to break up the ground and it effectively cross discs green manures, trash etc. Optional notched discs can be provided for more aggressive digging & cutting action. We are engaging and offering the best quality of Mounted Offset Disc Harrow. We have a wide range of disc harrows suitable for differeny soil cpnditon and with different sizes of tractors. Being one of the reputed organizations in the market, we are engaged in providing an exclusive range of Mounted Offset Harrow. Usage/Application: Agriculture / soil breaking,soil raising,soil turning and soil mixing. We are offering a wide range of Disc Harrow. This range is widely demanded in agricultural sector for the cultivation of soil. Known for high performance, efficiency, robustness, compactness and less maintenance, our range is manufactured by our experts with high precision. Karanpuri "Mounted Offset Disc Harrow" when mounted on a tractor becomes a compact unit that can easily be manoeuvered into corners on or short head lands. In addition the implement being easily attached and transportable in top speeds, little time is lost between the shed and the field. The harrow has a strong & study main frame with high quality steel discs & chilled cast iron spools. 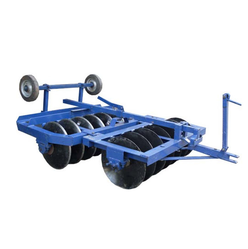 PTS Compact Disc Harrow is available in different specifications at market leading prices. We are enlisted among the chief Manufacturers, Exporters and Suppliers of PTS Compact Disc Harrow from India.